What’s your site’s conversion rate? Do you care? If not, you should. “Conversion rate” refers to the percentage of website visitors who actually complete a purchase, or take a desired marketing action. It varies from site to site, depending on what your goal is. If you’re a membership site, your conversion rate is the percentage of visitors who actually join. If you’re a retail site, how many visitors complete their purchase with you or move onto another site? 1. Analyze your website’s speed. How long does it take for your website to load? It’s fairly easy to improve your speed; one tool we recommend is Google PageSpeed Insights. How long will you wait for a website to load? The average visitor will only wait two seconds. Your visitors will walk away if it takes longer than that to access the information on your site (and it will hurt your rankings in Google). a. Old website architecture. Make sure you’re running the latest version of software; you might be surprised how much of an impact a simple upgrade can make. b. Large files. The bigger the files used on your site, the longer they take to load. Optimize your photos, graphics and videos for fastest loading time. 2. Add video. You don’t have to recreate the wheel. Adding links to relevant videos on YouTube or other sites not only increases your organic traffic, it will draw more visitors to your site. Visitors stay longer and spending increases on sites where video is featured. a. Make it snappy. The first 10 seconds of a video are the most critical; make sure those first seconds are engaging and relevant. b. One or two videos per page max. High-quality videos are your best conversion accelerator. But make sure they’re optimized and load quickly. If it takes more than a second to load, you’ve lost your visitor. c. Turn off AutoPlay. Website visitors are more likely to close a tab when a video automatically plays than they are to turn down the sound. d. Keep it to less than two minutes. The longer the video, the less likely the visitor will stick around and the longer it takes for your page to load. 3. Keep content consistently fresh. It typically takes five touches before someone makes a buying decision. If you’re consistently posting fresh content, along with a call-to-action, you’ll bring more visitors to your site. More repeat visitors means more potential conversions. a. Quality content is key. Don’t just load content for the sake of having something new on the site. Make sure it’s relevant, contains a call-to-action and is grammatically correct. Nothing stops a reader faster than misspelled words and bad grammar. b. Shorten it up. Content doesn’t need to be long. Keep it to 400 to 600 words, with plenty of relevant key words, images and bullet points. c. Mix it up. Have a combination of “how-to” articles, lists and guest posts. Not everything has to come from you. d. Link it up. Have plenty of links to other sites in your content; links increase search bots’ understanding of your content, and can help drive conversions. 4. Make it easy. Make sure your call-to-action is front and center and easy to use. Website conversions are all about user experience, so make it easy for visitors to find what you have to give them and to make the right decision. a. Tell them what to do next. After they’ve visited a blog post, a video or a specific page on your site, point them to the next step. Don’t assume they know what to do next. b. Narrow down the options. Give visitors one or two options – buy or sign up to get more information. Too many options will cause visitors to walk away. c. Make forms easy. Request only the minimum amount of information; don’t make visitors fill out the Gettysburg address. 5. Offer proof. Why should someone do business with you and your company? Offer customer testimonials, research that backs what you’re doing and engaging information that draws visitors back to you as the expert in your field. To gauge whether or not your website offer is firing on all cylinders, check out the Five Second Test. This service shows your site and offer to a large audience of users that have 5 seconds to answer your question. This could be related to the design or colors of your landing page, or it could simply be an answer to “what problems does this company’s products solve?” These tests show how much visitors remember and determine how likely they are to return. It’s a fantastic resource and one well worth running. You want to make sure to complete all the steps listed above before running any pay-per-click or SEO campaigns. 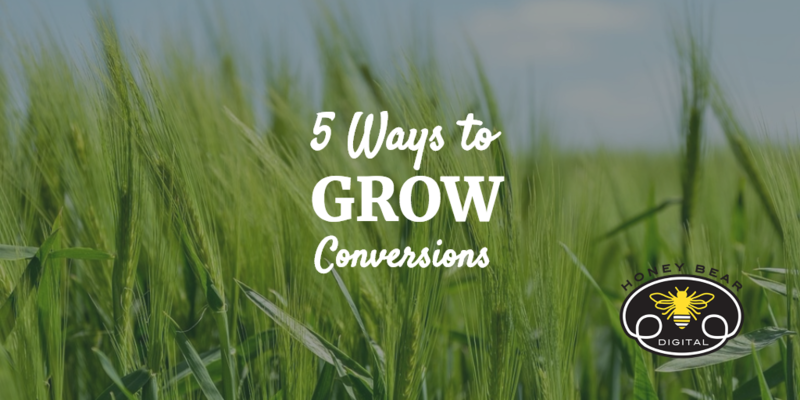 Want more information on how best to increase your conversion rates? Let’s talk!